Voting in Goa has finished peacefully and successfully on 4 February, 2017. Last phase of UP and Manipur election will be conducted on 8 March. After its completion, many Goa exit polls and opinion polls will be shared by agencies. We have covered many opinion polls released so far, and the upcoming surveys will also be covered here. Assembly elections in Goa are being held in 2017 along with four other states of India. These states are Uttar Pradesh, Uttarakhand, Punjab and Manipur. Election Commission of India had released the notification and elections were scheduled to be held in the months of February and March. Voting date of Goa is 4 Feb, 2017. Votes will be counted on 11 March, 2017 in all the assembly constituencies. Goa elections result will be declared on 11 March itself. Bharatiya Janata Party-Maharashtrawadi Gomantak alliance was selected by voters of the state in 2012 elections, this alliance will be eyeing another term here. Congress will be trying to form the government again after 5 years of wait. AAP will be debuting in the Goa assembly elections this year. They could impact the result of election. This party is already ruling the Capital of India(Delhi) and is capable of influencing elections unpredictably. Aam Aadmi party has announced that they will contest the Goa assembly elections on all 40 seats of Goa. It made the elections interesting and tough for the ruling party BJP and opposition party Congress. 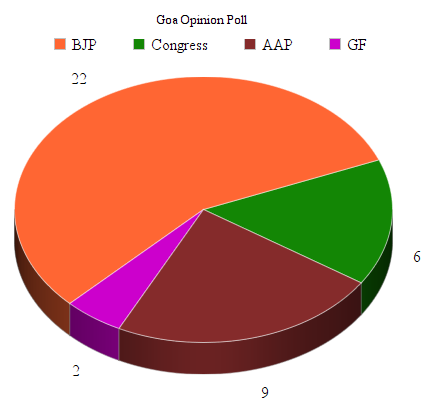 We have summarised the various Goa opinion poll results which are declared till now. The table shows a close comparison of all the predictions shared so far. Various news agencies had conducted their opinion polls in the past few months. Those opinion surveys were conducted to share prediction of the upcoming Goa elections results. Goa assembly elections 2017 prediction were shared by many news and polling agencies and they have anticipated political views of people around the state. Goa exit polls 2017 will be shared after completion of elections of all five states. Various agencies which have conducted and shared these polls include India Today-Axis, THE WEEK-Hansa Research, DP Associates, Prudent Media, Kautilya Survey etc. Chanakya opinion poll for Goa has not been shared yet. Chanakya exit poll for Goa elections will be shared on 8 March 2017, after completion of voting in all 5 states. We will share the Chanakya survey once it is declared. Voter turnout in Goa was 83%. North Goa saw 84% voting. 81.5% voting was recorded in South Goa. In Margao constituency, re-polling took place on 7th February. THE WEEK-Hansa Research has shared their opinion poll after conducting survey on a sample of people. The opinion poll is shared on 26 January, on republic day. This is yet another prediction of the forthcoming elections. None of the political party is anticipated to secure majority and hung assembly could be the end result. BJP has secured 17-19 seats, maximum seats as compared to other parties. Congress’ tally of 11-13 seats has kept them at second position. AAP barely marks their presence with 2-4 seats. MGP has 3-5 seats, another party with low tally. Since, these are just the prediction; exact results could be in anyone’s favour. As per the latest survey poll conducted by India Today-Axis BJP might win 20-24 seats in upcoming Goa elections 2017 with 41% vote share. Congress is likely to win 13 to 15 seats with 33% vote share. AAP is likely to win 2 to 4 seats in the polls and their vote share will be 8%. Maharashtrawadi Gomantak Party (MGP) might manage to win 1 to 4 seats. Other parties and Independent candidates likely to secure win on 1-4 seats with vote share of 18%. Survey poll was conducted on 12 to 20 December 2016 on 1,794 voters of Goa. Goa opinion poll 2017 has been surveyed by VDP Associates in 2016 and predicts the vote share and seats of major political parties of Goa. Opinion polls are predicting that the BJP might loss 4 seats as compare to the last elections of 2012 and they would remain in the power with the win of 22 seats. As per the survey polls Newbie party AAP will win 9 seats in the legislative assembly of Goa and will become the main opposition party of Goa. INC might suffer a loss of 3 seats as compare to the 2012 elections. They will be restricted at 6 seats with a vote share of 23.5%. As per India Today Axis survey poll BJP will win the necessary seats to stay in the power. As per the poll BJP will win 17 to 21 seats with a vote share of 38%. Congress will remain in second spot with a 34 % vote share and 13 to 17 seats. Bad news for the Aam Aadmi Party, as per the poll AAP will win 1 to 3 seats with 16% vote share. The Goa opinion poll 2016 conducted by Prudent media gives another prediction of Goa election 2017. BJP is expected to win maximum number of seats and the count is 17-18. Congress party is at second position with a win of 12-13 seats. AAP will be getting only 4-5 seats which is a very bad news for the party. MGP is expected to bag 3-4 seats. 1-2 seats is left out for the other parties. This opinion poll survey shows no clear winner in the upcoming Goa elections. Kautilya Teertha Data Analytics Survey Details: Survey was conducted on 80000 people of Goa of all 40 seats consisting 1640 polling booths. As per Kautilya opinion poll Aam Aadmi Party will be the biggest party in upcoming Goa elections 2017 if elections held today. As per Kautilya Teertha Data Analytics AAP will win 14 seats out of 40 seats. BJP will be on second spot with 11 seats and INC will able to win just 7 seats. Maharashtrawadi Gomantak Party (MGP) will win 6 seats and Independents will beg two seats. As per the predictions AAP will win most number of seats, however, it will remain far behind in forming government. 21 seats are required to form the government in 40 seated Goa legislative assembly. 35% voters went with AAP and 27 % voter preferred BJP in the survey. Current Defence Minister and EX CM of Goa Manohar Parrikar is still the favourite candidate for the Chief Minister post and MGP leader Sudin Dhawalikar remains on second spot. These survey polls are held on small sample of local voters and actual results might be differ.